The Great Wall of Sand: China is building new islands in the disputed South China Sea. Part of this is about natural resources—the South China Sea is thought to contain significant oil and gas reserves—but it’s also about sovereignty and the balance of military power in the region. Some of these countries have built up de facto control over some of the islands by constructing military facilities, airstrips, and ports to bolster their claims. 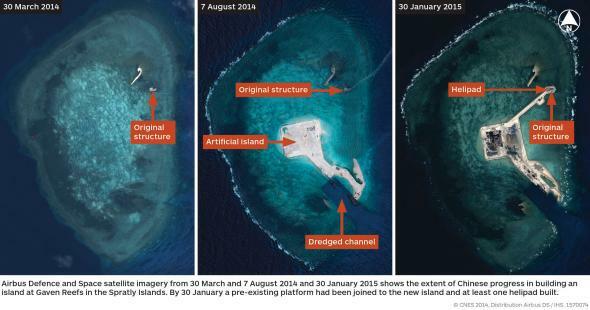 Until recently, China had staked its claims with just small concrete platforms on some of the reefs, but lately it has taken to simply building new islands out of nothing, as the photo above of construction in the Spratlys demonstrates. The rush to build new land follows the Communist Party designating the region a “core national interest” in 2012 as well as controversially declaring an air defense zone around it in 2013. To be fair, China is not the first or only country to build new islands for political regions. Malaysia has built up land on Swallows Reef in the Spratlys for use by its navy as well as a scuba diving resort. Further to the East, Japan has built artificial islands to bolster its case in its own territorial disputes with China. But China’s activities have been on an unprecedented scale. According to Harris, China has created 1.5 square miles of new landmass in just the past few months. One analyst told the Washington Post that China has done more construction in the region in the past five months than other claimants have in the past five years. In addition to the unfortunately little-discussed environmental impact of pumping sand and concrete into live coral reefs, the Great Wall of Sand is a serious political provocation. Consider the fact that a Chinese oil rig parked briefly in the Paracels last year led to clashes at sea with Vietnamese ships and contributed to anti-Chinese rioting. Given that possession is nine-tenths of the law in international territory disputes, China’s new land, particularly if military assets are stationed there, has the potential to dramatically upset the political status quo in the region. As neighboring countries respond, there’s potential for a dredge war in the region, as countries build up land to fortify their claims, though other countries don’t have the same construction resources as China. A detachment of Filipino marines has been asserting Manilla’s claim over a disputed shoal in the Spratlys from a rusting hull of a deliberately beached warship, for instance.